The faculty of Tourism and Hotel Management held a seminar on ” How to Pass an Interview and Write a CV?” on Tuesday 7/3/2017. 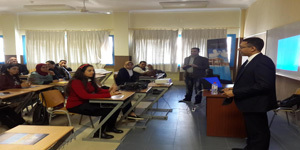 The seminar was given by Mr. Mohamed Dardeer, the HR Manager at Hilton King’s Ranch Hotel. The seminar was attended by Prof. Amany Refaat, the Faculty Dean, a number of staff members, teaching assistants and students from different classes. The seminar discussed the main set of criteria being used to select the would-be employees in the hospitality field. In addition, it was outlined the questions being frequently put to prospective employees in a job interview. The seminar attracted a lot of interest on the part of the faculty students. Some tokens were distributed among the most outstanding students at the end of the seminar.